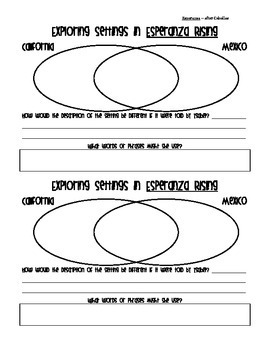 A notebook glue-in which allows students to compare the two very different settings Esperanza experiences in the text Esperanza Rising by Pam Munoz Ryan. Uses a Venn diagram, and also asks students to take another character's point of view to explore how POV influences setting and description of setting. Papercut and enjoy! Please check out the rest of my Esperanza products.